Barry is in “Pen World” Magazine! 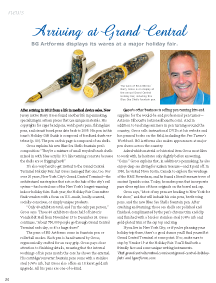 I was interviewed for an article that appears in the current issue of Pen World Magazine, under the “News” section. 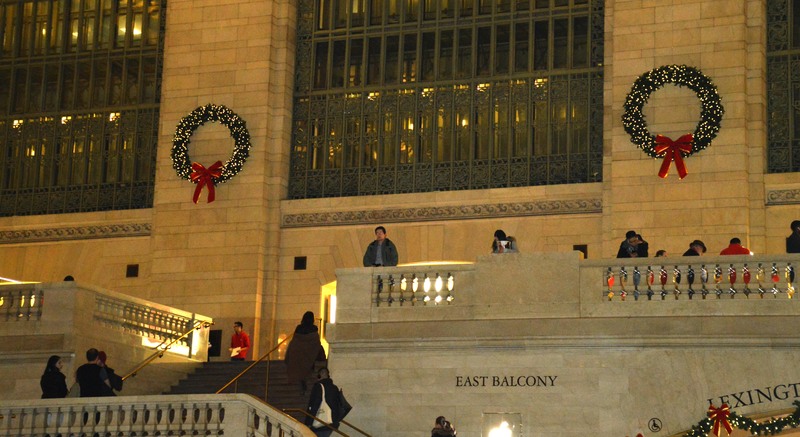 They were very interested in hearing about my participation in the Grand Central Holiday Craft Show. I’ve been here in NYC for almost a month, and still have about 10 days to go. Customers from Arizona Silhouette have stopped by to say “Hello”, and it’s always nice to meet our customers in person. 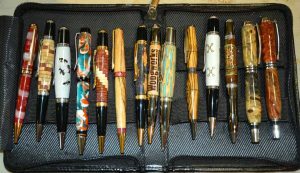 Lots of pen collectors, from the various pen shows that I attend, have also come by my booth. I have even signed a few of the Pen World magazines that people brought over to me! I’m happy to report that sales have increased this past week as we get closer to Christmas. Happy Hanukkah to our Jewish friends and customers! And Happy Turning to us all! It is day 17, we are still going strong, and building momentum! The crowds are getting bigger, and more people are stopping at the booth. At other shows people say they will be back to buy, and in my experience they do not come back, but here they actually do come back! Another observation that I did not expect was all the interest in Fountain Pens! I made a ton of rollerball pens in the Venetian & Arcadia styles and I am glad I did. These can easily be changed into fountain pens and I am worried I will run out of nibs – (nice thing to worry about). 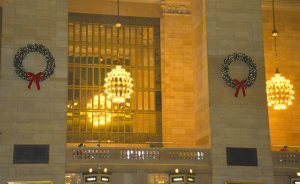 It is after Thanksgiving, and the Holiday decorations are up at Grand Central. The building looks even more festive. The traffic started picking up yesterday, and so did the sales. Pens from $45 to $900 were sold, in a really wide variety of pen styles and materials. Only 26 more days until the end of the show. The hours are long, but the people are great! The police now know who the thief was who stole a $200 pen the first week. (I picked him out of a line up) Good luck, and many thanks, to the detectives who arrest this creep! Well, I have to leave to get back to the booth. If you are near Grand Central Terminal please come to my little “pop-up” store! I have already enjoyed seeing many friends, students and customers stop by. It’s always a pleasure to see old friends and make new ones. Also, best of luck to all of you who are doing their own holiday craft shows! Greetings From the Grand Central Holiday Show In NYC! I have not seen this many people in my life! It is a constant, steady stream of people from 10 AM till 8 PM each day. I have over 1,000 pens for this show, and I started making them in June to prepare for this show. Sales so far are steady and strong. 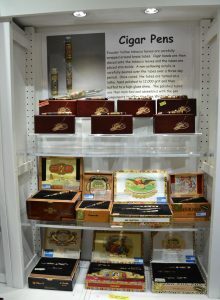 There are over 30 different pen styles in both acrylic and wood, and so far the best selling pens are the watch parts, cigar wrapper with their boxes, and shark vertebrae. Other hot pens are made with theme related inlay kits from Kallenshaan Woods. Below are some photos of my mini store when it is NOT busy. It’s the only time I can get out of my booth! 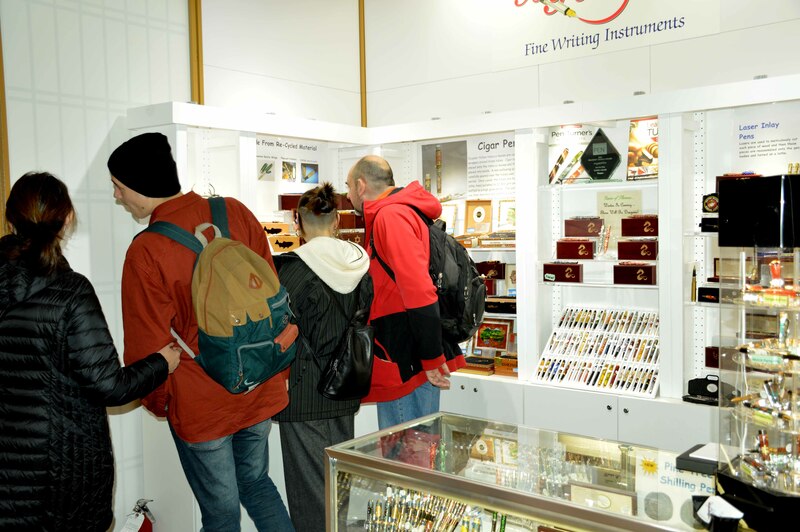 The customers are enjoying seeing all the diversity of pen kits and styles. I’m looking forward to being here another 30+ days. On a bad note, there are always people out to steal from you. I lost a $200 pen right off the counter when a person took it right out of the bag and ran as I went to get a total for the sale. 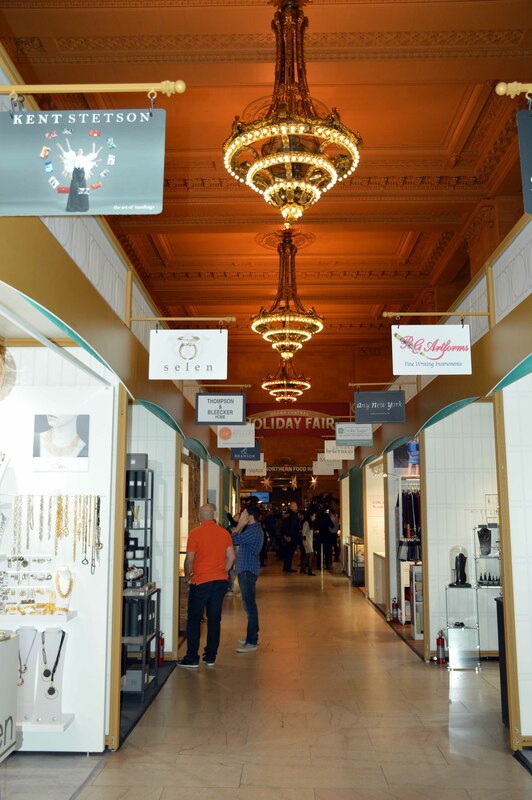 That is all for now – I will keep you posted on the progress of the marathon Holiday Fair Show! 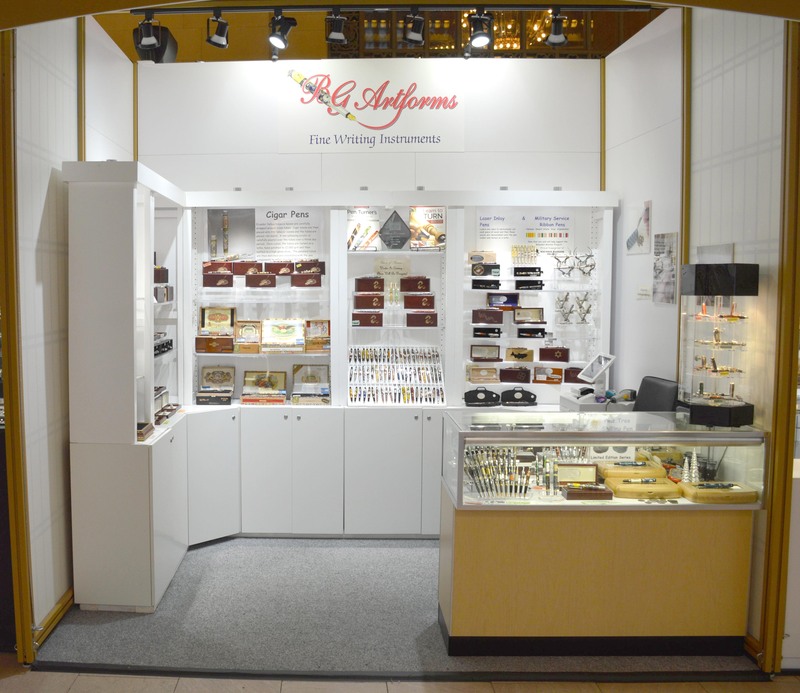 I am packing up and getting ready to leave for the Washington DC Fountain Pen Show held at the Sheraton Hotel, Tysons Corner VA. this weekend, August 5,6 & 7. 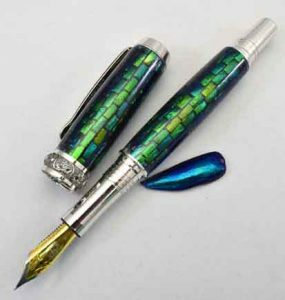 This is the introduction of the “Jewel of Thailand” pen made from jeweled beetle wings. I will also have all the original watch part pens there as well as many other special casted pens that I make. If you are around the Washington DC area this weekend stop by and see us! 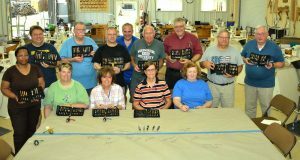 Great Pen Making Class & New Products! I want to thank all the attendees who participated in my Fine Writing Instrument Class at Arrowmont last week. Lots of pens were made, skills learned, listened to great music and more importantly, new friendships established! We even had “our service dog” Maria add to the fun! Experience level was from absolute beginner to intermediate but everyone learned something including me! 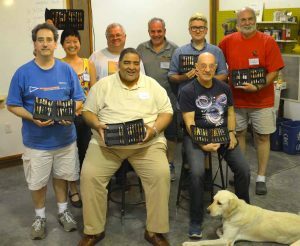 A special thanks to Dan who taught all of us about fountain pens and nibs – thanks Dan! Steve W.’s pens in just a week! Take a look at Steve’s pen – nice job Steve! While I was teaching at Arrowmont we received a number of New Products in the warehouse that I want to share with you. The Motorcycle Ballpoint Pen kit has really taken off and we have a few special blanks that just arrived for the Motorcycle pen kit. A special motorcycle pen blank was created for this kit and it is an exclusive for Arizona SIlhouette. New Kallenshaan Inlay kits were designed such as the Flames Inlay kit and the Skulls Inlay kit. Speaking of skulls, we received new skull inlay kits for the Sierra and the Skulls Pen. Polymer Clay pen blanks are back in stock but not for long. We received 19 of them in and only 11 are left and it has only been a few days! Last, but certainly not least we are now an Alumilite and Pearl Ex Dealer! We have Alumilite Clear and Alumilite White casting resins along with Alumilite Dyes and Metallic Powders. Our Pearl Ex selection has over 19 different Pearl Ex powders to choose from. In addition, we are starting to offer stabilized Burl Casting Material (live edge pieces) to go along with all the Alumilite and Pearl Ex products! So take a peek at the New Products section of the website for all the new products we just received. Great Week at Marc Adams School! 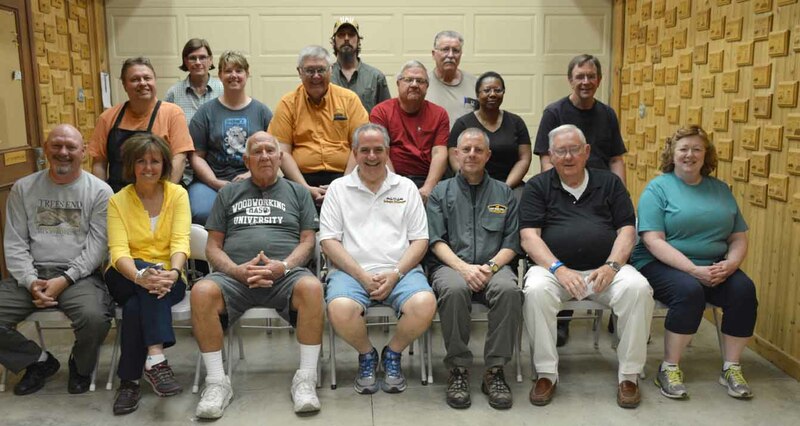 Fine Writing Instrument Class – good looking group! Bangle Class students with bracelets – nice Job! I want to thank all the students who attended my classes from the Fine Writing Instrument and the Bangle Bracelet Class this past weekend. I enjoyed working with all of you and it was really nice to see students of all ages attend! Everyone enjoyed the class (they told me they did, so I believe them) and we all learned a lot of techniques and tips. Students at work on their castings. One of the most rewarding aspects of teaching pen making is when young people want to learn how to make a pen. Last weekend in New England, I had the pleasure of working with a very nice young lady, Danielle, who wanted to start her own pen making business. Her father was 100% behind her idea (that is who took the picture) and this is Danielle’s first pen! 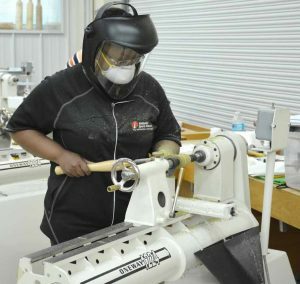 Her dad was the investor who made sure she had all the tools to properly, and safely, make her pens. Just think about what a young person, or anyone, can do with a micro business like this. The start-up costs are fairly small. An ambitious person could pay off the equipment, and start turning a profit, within a couple of months. Students can let their friends and family know about their business in person, and all of their social media friends can follow along when they post photos of their pens for sale. It’s a great opportunity for a young person to own their own business, have flexible time, and make more than just working in a fast food place. And they would certainly have their teacher’s gifts covered! We want to wish all of our friends and customers a VERY Happy, Healthy & Prosperous New Year for 2016! Welcome To Our Third Annual Anniversary Sale! The Whole Store On Sale At 10% OFF*! 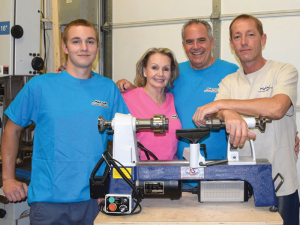 Being a family run business we appreciate ALL our loyal customers, and assure them of the highest standards for quality service that they have come to expect from all of us. We like to reward that loyalty with good, and sometimes exceptional, deals! In preparation for the upcoming fall show schedule we go through the warehouse, clean it, (Cole loves that job!) and get ready to offer new products. We are offering some fantastic discounts up to 65% off on popular kits to help you gain greater profits for your business. When you succeed we succeed! So take your time and browse through the Anniversary sale section, and have some fun while saving money! *The fine print: The anniversary category has discounts far beyond 10%, so the coupon will not take an additional 10% off of these products. 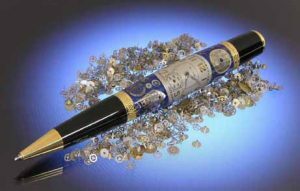 Other discount exclusions are the stabilization products, bangle bracelets, lathes, and new nickel lever action pen kits. On behalf of Lenora, Michael, Cole, Susan and Tera we want to wish you a successful fall show season. 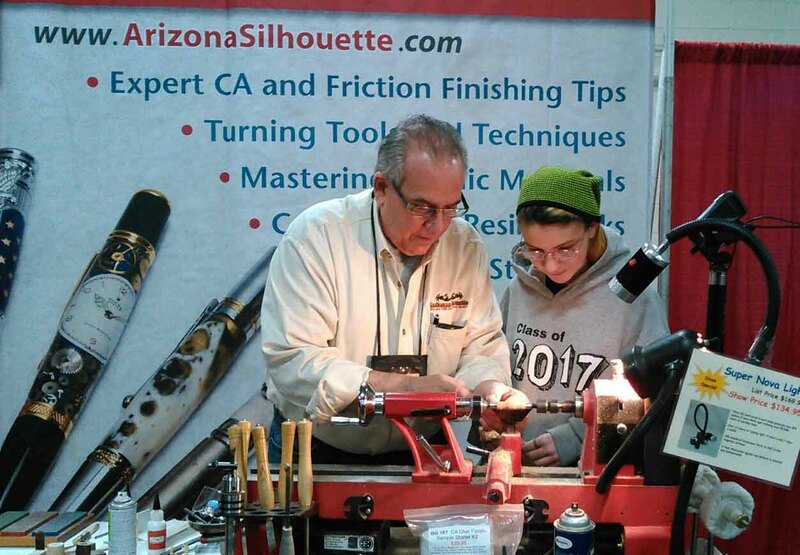 Lenora & I look forward to seeing each of you at The Woodworking Shows in 2016!